This classic baseball park is in the shadows of downtown of its host city. It was built when its team moved across the country in 1962. Its max capacity is a respectable 56,000...but its parking lot only allows for 16,000 cars. That's a bit of a problem since the venue is in the center of a "car culture" where carpooling is encouraged, but isn't the norm. 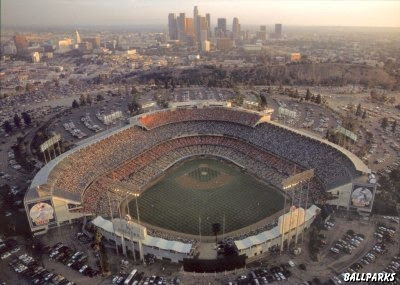 The stadium was built in Chavez Ravine just outside of the city near the freeway following a 1957 helicopter ride. The team owner Walter O'Malley asked the county supervisor if he could use that land...the supervisor responded, "No problem." Who'd have thought LA could have such easily obtainable real estate? If you make the trip to Dodger Stadium, make sure you try a Dodger Dog. At $3.50, this footlong frankfurter is a real bargain for LA LA land. Next up is a place near and dear to the BS staff hearts as we all visited there a few years ago. Also a West coast venue, this stadium is one of the largest in the land. I'll admit, I got goosebumps as I got to the end of the tunnel and watched Tim Stratton playing catch with other Boiler faithful in the end zone seats. The setting of this venue is fantastic as it's nestled in the hills of a wealthy SoCal neighborhood. That said, there's not much around the place except parking, which there is plenty of. My Dad visited this Grand Daddy of a venue the last time Purdue played there...too bad the wait was a mere 34 years. If it wasn't for the concourses and ridiculously narrow tunnels, the Rose Bowl definitely would have ranked higher simply because of its unique relationship to the Big Ten Champ. The next venue really surprised me that it ended up in the rankings. 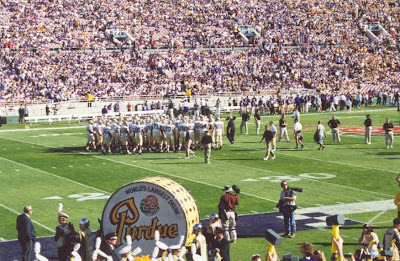 But, it was another special Purdue game that I attended when I was a Freshman back in 1994. The setting of this arena is quite nice on the banks of a river. The concourses are pretty wide and the sightlines are good, but the seats are pretty steep a la Conseco Fieldhouse. The record crowd in this arena is an eye-popping 25,000...pretty large for a uni-purpose collegiate basketball facility. I got to witness Glenn Robinson's last game for Purdue at Thompson Bowling Arena on the University of Tennessee's campus...that surely didn't hurt its ranking. That said, it was a pretty good place to watch a game despite the fact that my ticket was in the nosebleed section. TBA is simply awful looking on the outside, but awfully nice on the inside, where it counts. The next venue was the host of Tim's favorite NBA team. Unlike most NBA arenas, this place was not in the city of its team. Many said that hurt attendance. 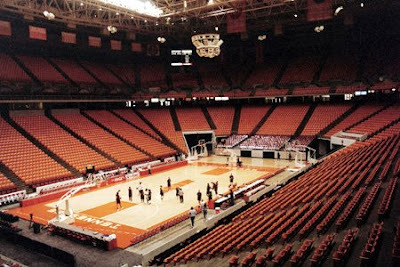 That said, in '93 & '94, the average attendance of a game in the Coliseum was 18,000. She was built in expectation of urban sprawl in the county just South of Cleveland near major interstates. She hosted an NBA All-Star game in 1981 and is probably most-remembered for hosting Jordan's shot over Ehlo in Game 5 of the first round of the 1989 NBA playoffs. The Cleveland Barons also played there for three seasons. 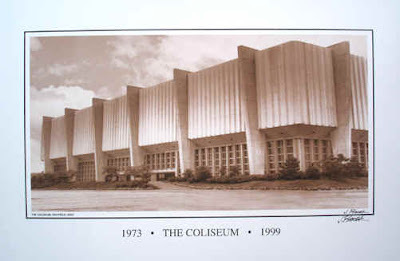 The Coliseum at Richfield, while large, only had one concourse which made it feel much tighter than it actually was...this is probably why its life as an NBA arena was a mere 20 years when it was replaced by Gund Arena in 1995. This stadium hosts a favorite team of mine as they A) seem to own Notre Dame & B) are located near one of my former places of residence. It was first built on the lower campus of the small Northeastern-based Jesuit college in 1957. Initially, the stadium had a track around the football field, but in 1994, it underwent major renovations that increased capacity to nearly 45,000. It's a very utilitarian-feeling venue in that it's a touch cold, but the sightlines are very good and the concourses are wide enough for BC crowds. 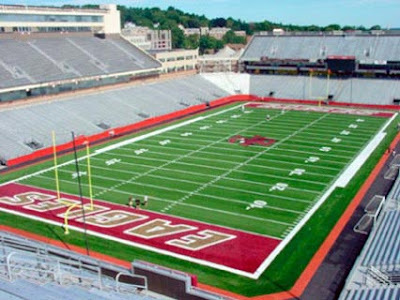 Boston College's Alumni Stadium checks in at 16 simply because while it's not a particularly large venue, it's definitely one that is a good place to take in a college football game. May 31 Kinda Like Old Times?